Trifles are a traditional layered dessert made with alternating layers of fruit, cream, and cake. This one takes that normal recipe but adds cranberry to give it a bit of tang and a new take on the traditional berry versions you would often see. The cranberries are cooked into a jam and have sugar, orange peel, cinnamon and elderflower liqueur added to create a sweet yet complex flavored jam. Instead of cream, they are using whipped mascarpone, a cream cheese like Italian dish, often used in tiramisu. Angel food cake is known for being both tasty and healthy too. Add some tart cranberry jam for an unforgettable dish like no other. 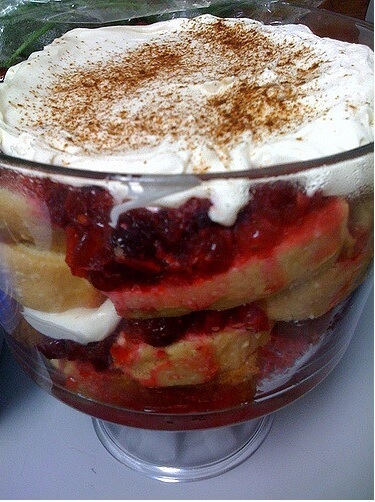 The cranberry trifle is perfect for a dessert made around the holidays. Contrasting flavors and textures make the dish a special item to be tried. Creamy whipped mascarpone is a fine finishing touch to add as well. It allows for a little cake decoration and a sweet touch at the end.